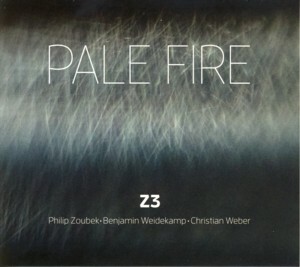 This is the debut album by the trio called Z3Find albums by this artist, led by Austrian pianist / composer Philip ZoubekFind albums by this artist and including German clarinetist Benjamin WeidekampFind albums by this artist and Swiss bassist Christian WeberFind albums by this artist. The album presents seven original compositions, all by Zoubek. Zoubek points to the legendary Jimmy GiuffreFind albums by this artist trio with pianist Paul BleyFind albums by this artist and bassists Steve SwallowFind albums by this artist as the source of inspiration to create this trio, and many points of reference are indeed present, although there is no attempt to directly follow or copy the work of Giuffre and his cohorts. The piano "plays the first fiddle" on this album, clearly navigating the music towards a melodic progression, which is followed by the clarinet and bass in a series of tête-à-tête and ménage a trios encounters. The overall atmosphere is completely relaxed and non-aggressive, which always helps in an Improvised Music environment, creating a true close encounter between the trio members. Weidekamp plays magnificently here and his beautiful tone reminds me of the performances by my beloved Harold RubinFind albums by this artist. Short phrases and delicate breathing-like uttering, little melodic statements and fragile triplets create an ornate aura around the piano stating the melody and the overall result is simply magical. Weber, who is one of the busiest and most prolific bassists on the European Improvised Music scene, with three solo albums and dozens of recordings to his credit, displays a certain measure of respect and distance, playing sparingly but superbly on time and exactly where his contribution is needed. This kind of subtle support is amongst the most difficult contributions a musician can offer to his partners. Together the trio creates a continuous flow of excellent and fascinating music, which keeps the listener on his toes from start to finish. In fact this is definitely one of the best releases on the first-rate WhyPlayJazzFind albums on this label label to date. There is definitely nothing pale about the fire found on this album, I assure you!